The Fillmore Central boys landed in fifth place in the team standings at the 2019 Dale Feeken Memorial Track Meet held on Friday, April 5, in Hastings. The Panther boys scored 40 points at Adams Central. The FC girls scored 32 points and ended up in seventh place at the seven-team meet. 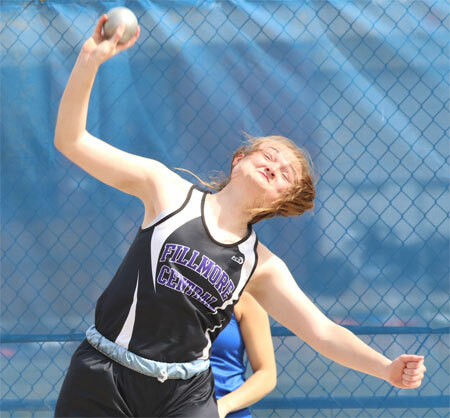 Panther Erin Schmidt topped the field on Friday in the girls shot put winning the event with a toss of 35-feet, 2-inches. FC sophomore Jake Stoner also took gold in the boys long jump with a leap of 20-11.25. Earning points in the Class B, large Class C meet on April 5 for the Panther boys were: Connor Asche, fourth, shot put, 41-4; Stoner, third, 100-meter dash, 11.53 seconds; Stoner, fourth, 200-meter dash, 23.83; De Maciel, fourth, 800-meter run, 2:14.96; Garrett Nichols, third, 1,600-meter run, 5:06.64; and the 3,200-meter relay squad of Maciel, Hunter Verhage, Dakota Nun and Nichols, third, 9:15.76. Earning points for the FC girls on Friday were: Vanessa Lukes, sixth, 100-meter dash, 14.24; Macy Scott, sixth, 800-meter run, 2:53.33; Jacki Schelkopf, fourth, 1,600-meter run, 6:32.40; Teneal Barbur, third, 3,200-meter run, 14:10,95; Abby Nichols, fourth, 300-meter hurdles, 56.30; and the 3,200-meter relay team of Scott, Jordan Broman, Schelkopf and Sydney Hiatt, third, 11:33.19.